In a world which is occupied with the developments at information technologies and mass media, communication is not only today’s popular profession but also that of the future. Besides we know that the underlying reason of human differentiation from other living is communication. On one hand the communication is a fact connected to technology, on the other hand it should be handled as a fact relevant to behavioural sciences. As Üsküdar University Communication Faculty, we provide an educational practice related to those two sides of communication. The thematic structure focused on behavioural sciences of our university provides a basis on the education of communication given in our faculty. On one hand we aim to educate communication experts who will guide people of our era who have to sustain their lives nested with the communication technologies. On the other hand, we give a formation aimed to educate communication professionals competent to use this technology most effectively. Furthermore with the education given in our faculty we aim our students will have an intense intellectual accumulation, will gain analytic, interrogative and critical perspective. Because in any field of communication, a communication professional should primarily have the competence for critical and analytical way of thinking. Furthermore, a communication professional, should be familiar with technology, especially information technology as a necessity. A communication professional should have the ability to use technology and chase the technologic developments. Education of communication can’t be constricted into university campuses undoubtedly. 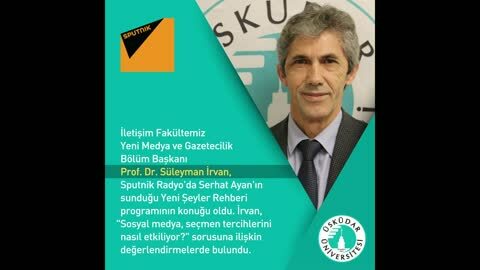 So we, as Üsküdar University Communication Faculty are attentive to actualise an education practise in corporation with several fields of communication sector. We strive for our students to have opportunities for job trainings in several media and communication organisations by bringing them together with experienced professionals of media sector in order that they get ready for the profession with much more equipped knowledge. As communication faculty we also give a formation at international standards. We care about our students to be able to take a part of their formation at universities abroad within the scope of Erasmus etc. exchange programs and we have lots of collaboration connections al intentional level. Briefly stated, as Üsküdar University, our goal is to educate critical, interrogative, analytical, qualified communication professionals.